Our guide to reclaimed lumber offers pointers to such companies as Elmwood Reclaimed Timber and Vintage Timberworks -- plus descriptions and contact information. Based in British Columbia, this small company creates flooring and lumber from old Douglas Fir, reclaimed from demolished buildings and bridges. Wide plank flooring up to 12" wide and 16 feet long. This Canadian company specializes in wide plank flooring it makes from lumber felled generations ago and then reclaimed in recent years from Canadian river bottoms in the Ottowa Valley. Specialists in heart pine and cypress flooring milled from logs reclaimed from southern riverbeds. 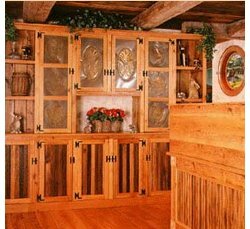 Products include high-end flooring, trim, paneling, lumber, stair parts and mantels.